First Thai at Purvis Street has been around for a few years, so it’s not surprising that the Thai eatery is perpetually crowded during meal times. After a quick glance at the menu, we ordered a few items to share. 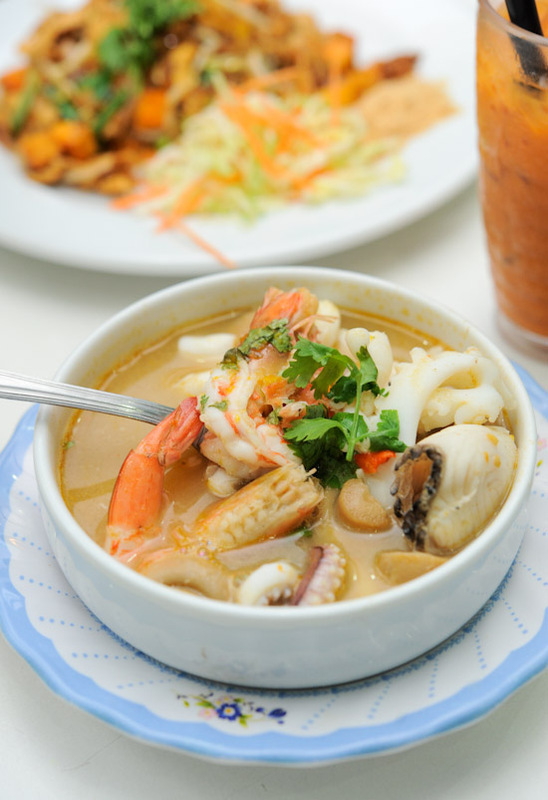 The Tom Yum Seafood (S$7), a classic Thai dish, came first. Hot and spicy, it was the perfect dish to start off our Thai feast. Following the Tom Yum seafood soup, we had Olive rice (S$8), Fried Prawn Cake (S$3/pc), Basil Leaves Fried with Pork/Chicken (S$8), and Phad Thai (S$8). Even though nothing in particular stood out, we had a pretty satisfying dinner. 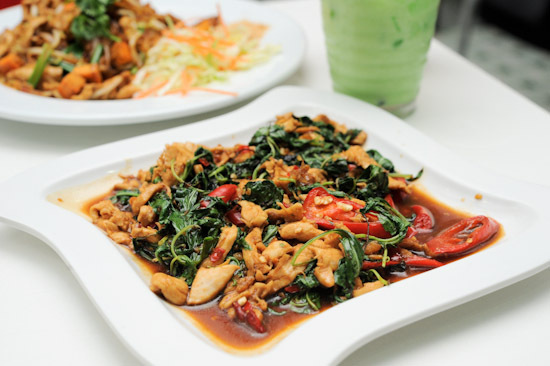 While First Thai Restaurant has garnered many supporters over the years, we prefer Jai Thai – just down the road at 27 Purvis Street – which has equally good, if not better Thai food at slightly cheaper prices. A pity you didn’t get to try the steamed fish! It’s really huge so its good for groups above 4 persons. It comes in a really huge dish (the whole fish of course) and the one time I’ve tried it it was not overcooked (rare occurrence). For lunch, my lunch buddy used to swear by the duck noodle. Very tasty. This place has lots to offer and sights and smells does take you back to Thailand. I wonder what the olive rice tastes like? I love phad thai n pineapple rice too! 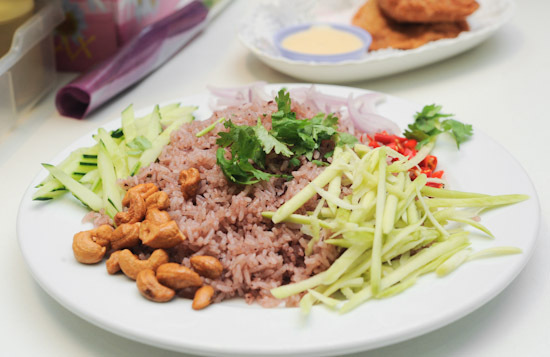 But I have yet to taste any thai food as great as those in bangkok! BOOOHOOO! next time bring u eat pineapple rice lahhhhhhhhhhh! Actually I prefer Jai Thai next door. First Thai is more ex compared to Jai Thai and Jai Thai’s taste feels more authentic to me though.. I used to eat at First Thai 5-6 years ago, several times a week in fact. Food was tops and the staff was really friendly. The mood was relaxed and you could eat like a king on a reasonable budget. But the standard really plunged. Portions became tiny, the queues got longer, and the staff became really rude and surly. Some of the items are still v good, but I don’t think it’s worth the hassle and prices. I am a huge fan of Thai food, but sad to know I could no longer eat here.